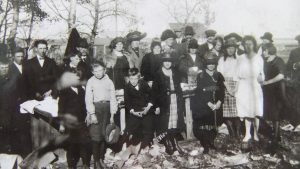 GREAT GRANDMOTHER SOPHIE MARIA LOUISE HUMBKE (SCHNEPEL) BRINGS HER FAMILY FROM WODEN, IOWA TO 3 HOMESTEADS 14 MILES EAST OF WETASKIWIN, ALBERTA IN APRIL, 1901. 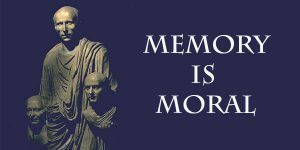 Preamble: Before beginning this blog I would like to urge you to read an article by Brett & Kate McKay published Nov. 21, 2016 “Memory is Moral: Why Every Man Should Do His Genealogy” www.artofmanliness.com. The most meaningful two reasons for finding out about our relatives are expressed in the following two quotes which are taken from the article. The first death comes when their body physically expires. The second occurs when their name is spoken for the last time. For most people, their second death arrives when the last person they knew during their lifetime also passes from the earth. No one remains who knew them in the flesh, and their memory is buried along with their bones. For those people whose posterity does their genealogy, however, their memory never dies. Their name is read and known by he who first compiles a family tree, and by all the individuals who come after and keep sacred the record. Viewed in this light, genealogy is an act of redemption. Through our family history research, we can save our ancestors — even the lowliest and most apt to be forgotten — from the second death. 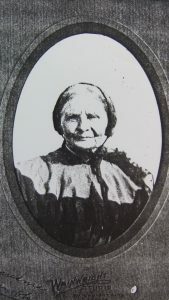 My Great Grandmother (some of you will refer to her as Grandmother; Great GM; Great Great GM; or Great Great Great GM) – the Matriarch of the Humbke Family in the USA and Canada, was Sophie Louise Humbke (Schnepel). This name was verified by Reverand Robert C. Greene while visiting churches in Windheim and Dohren, Germany. Reverend Bob’s wife in a 6th cousin, one removed, of my grandfather Ernest Dietrich Friedrich Humbke Sr. The Reverend lives in Georgetown Texas and as a Master Genealogist has added over a million individuals to his family tree in Nov. 2015. On documents and during her life in North America Great Grandmother was most often referred to as Louise. On her will, written in 1923, Louise signed with a “X”, possibly because of age as she did sign with a signature on earlier occasions. Louise was born at #38 Dohren, a small German village a few miles North of Windheim on the (East) side of the Weser River. If you go to Germ any a great trip would include the German Emigration Center & German Maritime Museum in Bremerhaven; plus a trip up the river by boat from there to Windheim or the closest city the boat docks. Louise was born on 11 Sep 1843 to Johann Fridrich Konrad Schnepel b. 24 May 1807 d. 26 Feb 1875 and Marie Luise Elizabeth Schnepel (Kaelcke) b. 15 Jan 1814. They were married 24 Dec 1833 in Dohren. Johann’s siblings were a. Marie Sophie Elisabeth m. to Conrad Diedrich Nurge; b. Johann Cord Diedrich m. to Christine Luise Charlotte Berning; c. Johann Diedrich Conrad m. to Marie Christine Wilhelmine Nurge; d. Marie Sophie Wilhelmine m. to Friedrich Conrad Wilhelm Lubkemann; e. Christine Luise m. to Johann Friedrich Christian Schnepel. Luise’s siblings were a. Caroline Luise; b. Sophie Elisabeth; c. Johann Conrad Diedrich m. to Christine Wilhelmine Dammeier; d. Sophie Luise Wilhelmine m. to Johann Friedrich Konrad Kaiser; e. Marie Caroline Charlotte m. to Heinrich Wilhelm Schopman; f. Johann Friedrich Wilhelm; g. Sophie Charlotte m. to Friedrich Conrad Mertens..
Louise’s siblings were Ernest Friedrich Conrad m. to Catherine Lisette Dorette Busching and Auguste Wilhelmine Luise. Louise Schnepel marries Ernst Humbke has 7 children in Windheim & moves to USA. Louise was married on Oct 27, 1867 in Windheim to Ernest “Dietrich” Christian Humbke and 3 days later their son Ernest Dietrich Christian Humbke Sr. was born. During the 1800’s in Germany the birth of illegitimate children was a common occurrence and often meant the child could not inherit property. As a result, children born during the 8 month period after a marriage was a common experience. 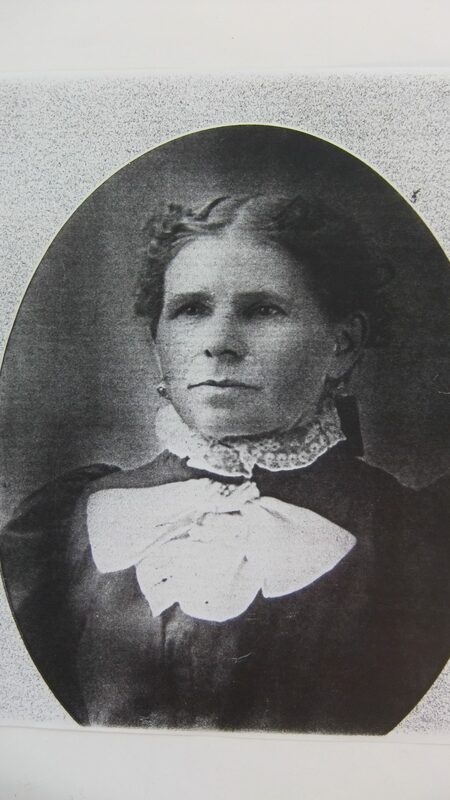 After her son Ernest Sr., Katherine Sophie Marie was born on Oct 17, 1869, and then Louise experienced the grief of losing her next two children. 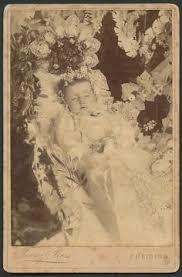 Sophie Wilhelmine Louise was born on Aug 30, 1872 and died 2 months and 8 days later on Nov. 4. Another daughter, Sophie Louise followed quickly in Oct 3, 1873 and then Louise Wilhelmine Marie on Jun. 17, 1876, before the second Sophie died on Feb, 1878 at age 4 yrs. and 4 m.
One can only reflect on their names, dates and the joy the two deceased girls must have brought their parents and siblings. The memories of those two girls, plus all other still and premature deaths, should be remembered in family histories. A special church service should be held at all family reunions where the names are called out, of all ancestors who have passed away prematurely. Dietrich and Louise Humbke arrived in the USA in 1883 and spent a year at Buffalo Centre, Iowa before going to White Lake, South Dakota where they homesteaded and added two more girls (Alvina & Emma) to their family. In 1891 the family bought and moved to a farm North West of Woden, Iowa where they settled until 1901. In 1899 Dietrich was killed in an accident and in early 1900 Ernest Sr (now patriarch) went to Alberta, Canada were he filed for 3 homesteads. 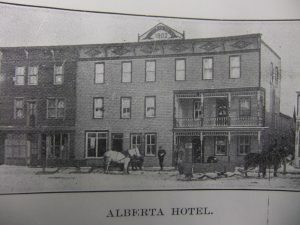 He returned to Iowa where plans were made to move to Wetaskiwin, Alberta in early 1901. Ernest Humbke sr., Dietrich Humbke & brother-in-law, Carl Callies head for Wetaskiwin to be followed by Louise, 4 daughters & grandson, Herman Callies . 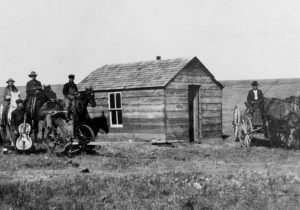 On March 16, 1901 the men left Woden, Iowa with 3 boxcars of machinery and animals to prepare homes on their Alberta homesteads. Two weeks later Louise, Minnie, Mary, Alvina, Emma and 2 yr. old Herman leave Woden and arrive in Wetaskiwin 4 days later (April 4, 2001) on the first all passenger train running from Calgary to Edmonton. Rooms cost 20cents a person and a meal was served in a large bowl at a long wooden table for 20cents. 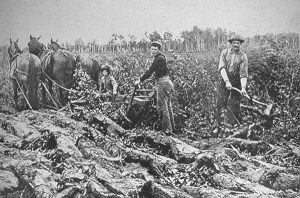 Since the men were hauling lumber from Wetaskiwin, their frame home would have been considered an improvement over the sod home they had in South Dakota or a common log cabin. The first shelter was small, but they would soon have a 16′ by 26′ (416 sq ft) frame house that the 4 adults and two grown children would call home. A typical Alberta frame homestead house with a door and a window. Horses were the means of transportation and music, dancing, playing cards and visiting were the main forms of entertainment. 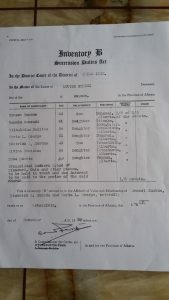 On Sworn statements and Statutory Declarations in 1904, that gave Louise, Ernest Sr. and Diedrich Humbke clear title to their 160 acres each, the value of Louise’s house was $400 (approximately $11,000 in 2015 dollars). They could all live in one home from which they could look after their three connected quarters (160 acres each) of land. In 1902 Ernest Sr. would marry and build his own 320 sq ft home and in 1903 daughter Mary would marry and move to Joe George’s (her husband) home. Their first Canadian prairie winter would be on them in 6 months and they needed to grow a garden; prepare a fire guard; dig a well; build shelters for the animals; prepare a wood pile and put up hay for the livestock; and start breaking the land. From 1901 to 1904 Louise listed on her documents that she had constructed a stable, chicken coop, pig pens, smoke/root houses and 1 mile of barb wire fence. Breaking the Virgin Ground was the hardest work. It seems that a team of four large oxen was best for pulling both plowing the ground and pulling out the large stumps, but because of availability local horses were more commonly used. The Homestead Act gave a claimant (160 acres, or 65 hectares) for free, the only cost to the farmer being a $10 administration fee. Any male farmer [Louise was one of the few women granted a homestead] who was at least 21 years of age and agreed to cultivate at least 40 acres (16 ha) of the land and build a permanent dwelling on it (within three years) qualified. On 14 Sep. 1904 Louise received her Certificate of Naturalization as a British Subject, and is within Canada, entitled to all political and other rights, powers and privileges, and is subject to all obligations to which a natural born British subject is entitled or subject within Canada. Appendix of survivors of Louise Humbke (Schnepel). 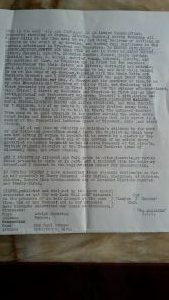 Louise’s original will was hand written by Henry Kuring, the Luthern Pastor who was to marry her grandaughter Erna Humbke. 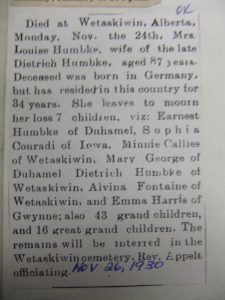 Louise health was fading and she may have been in Wetaskiwin a month or a year before she passed away on Nov. 24, 1930 at age 87. She was interned at the Wetaskiwin City Cemetery by the water tower. 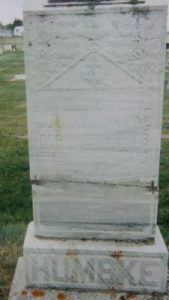 Her upright tombstone was broken sometime in the 2000’s, but has since been repaired leaving the line 1/3 up from the bottom. One can only wonder about the mental state of individuals who do such acts. In her will Louise’s assets were valued at $4,189.19 ($57,604 value in 2016 dollar)s. One third $1,396 (2016 $19,197) was given to the Lutheran Church and two thirds $2,793 (2016 $38,407) was divided evenly between her seven children. Roger – I agree with Alison – the stories are the things that interest me the most. I love the stories and the insight into the big life changing moves that our ancestors have made. And the quote about you are not forgotten until the last time your name is spoken is very poignant and speaks to me. I speak of you often and I hope you know tha. Such a nice comment. It is very encouraging to hear that you are enjoying the stories of your ancestors who came from Germany and knowing that you are just carrying on a family tradition. The next blog will be about your great grandfather, Ernest Humbke Sr. followed by your great grandmother, Mary Humbke (Westenfeld). Mary is the closest relative that I know least about, but I am searching and already see similarities to both your grandmother and mother. It might have something to do with the fact that they all grew up on farms where making a living was a real challenge. Thank you so much for doing this. I find it so enjoyable to read about the family. I must say I am more interested in the stories as I get confused easily with all the greats, second, third family members. I still don’t think I could tell you how everyone is related….maybe that will come with time….lol. It is especially gratifying to get support from a wonderful niece. Hope every thing goes well for you at the University of Calgary and a very Merry Christmas to you and Ken! Thank you for all of your posts so far and I find them very interesting and informative. The pictures are excellent and your work on this is much appreciated. I look forward to reading more. I appreciate your comments. They give me the motivation to do the blogs more often. Any suggestions are welcome.